My mum knows me so well. Make up palettes, limited edition Christmas ones in particular, are one of my beauty weaknesses. 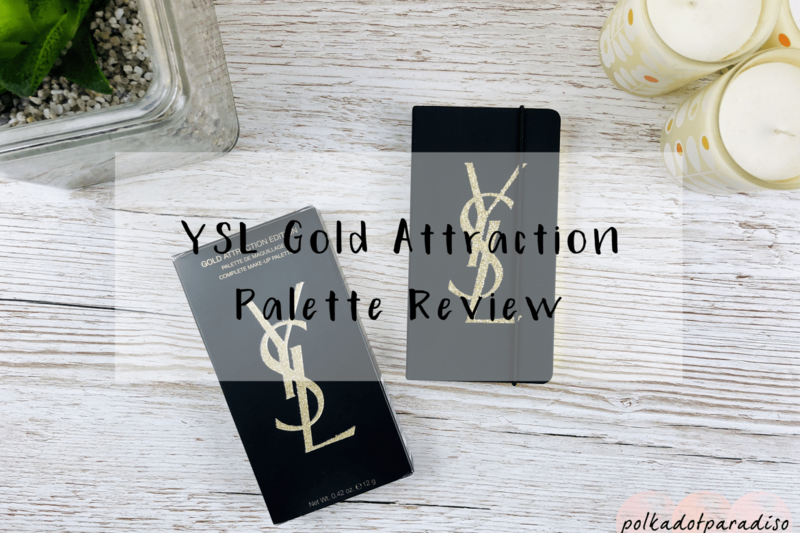 Knowing this, my mum bought me the YSL Gold Attraction Palette for Christmas. This may be the most beautiful palette I’ve ever seen. Once you get it out of the black and gold glitter box you find this lovely book style palette, held by string. When opened, a gorgeous, compact face palette is revealed. With a mirror on one side and three different brushes, this is perfect for on the go make up. On the right, you’ll find two blushes, a cream highlight, three powder eyeshadows and one cream eyeshadow. In terms of the blush, my favourite is the darker of the two shades. I would still use the other colour though. This makes me wonder why they put two similar small blushes in instead of one larger pan. The tiny brush that comes with it makes application tricky as it tends to dollop a chunk of colour on one area. Instead I tend to use a travel sized blush brush from either Real Techniques or Eco Tools for better application. I absolutely love the highlight. I didn’t realise it was cream the first time I used it and applied it using my regular brush. I’ve used my fingers since then to apply. It gives a really nice glow, and without too much glitter meaning I’d be happy to use this all year round. It’s an interesting mix of eyeshadows in this palette, with them all glittery. Great for over Christmas but I’m going to struggle to use this on it’s own all year round. The first two are quite subtle and great to finish off a look. The sparkly black I’ve only dare use as an eyeliner so far although I have seen a great look with it used all over the lid (topped with the silver). The silver cream is amazing and applies like a dream. I haven’t used this yet though. I find the small brush that comes in the palette is too thick to use it as an eyeliner brush so I need to dig out a thinner brush to use instead. This all over the lid would look amazing for a Christmas party. The colour pay off is good in these shadows and they’re really easy to work with. I’d say their quality is higher than that of last year’s palette which is a relief as it was the only thing I didn’t like about it. I absolutely love this palette. It’s so small that even though I probably won’t use the eyeshadows all year round I’ll happily take this traveling, paired with a small eyeshadow palette. The design of this makes it one of my favourites ever. I love how much more subtle it is than last year’s with it’s matte black exterior. The only shame is the glitter on the logo does have a tendency to fall off and get everywhere. I’ve now had the YSL palette two years in a row – I can’t wait to see this year’s Holiday palette to make it three! Passionate about beauty, crafting and planning; I bring these together with beauty reviews and advice, crafty makes and productivity hints and tips!